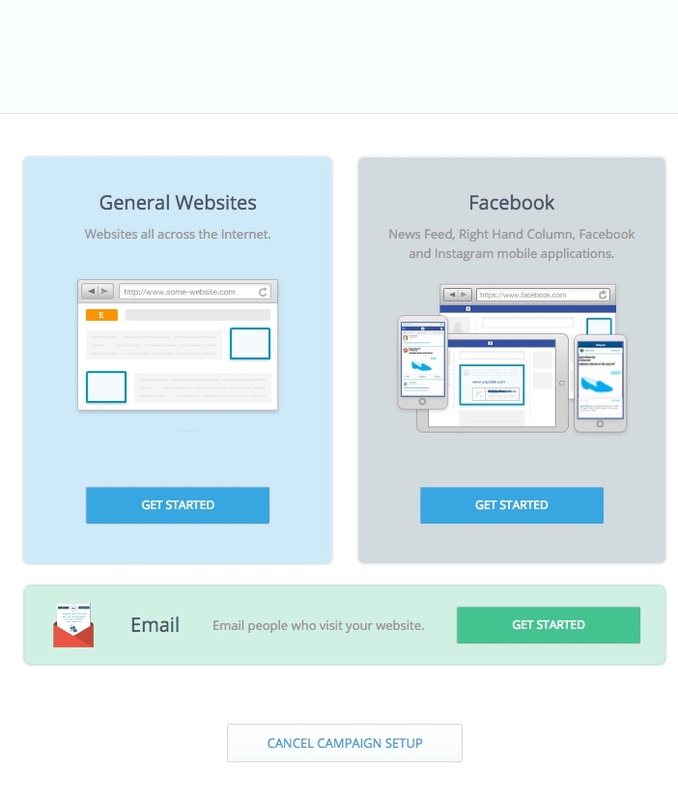 AdRoll works with Google and Facebook to help you create fast and easy ad campaigns. AdRoll Prospecting and AdRoll Retargeting work in tandem as a complete marketing solution to attract and convert more customers. Conveniently place ads, monitor performance, and fine-tune your campaigns with an easy-to-use platform. You can also seamlessly integrate AdRoll with the top marketing apps. Please note: Prior to this set up there will be code that you will need to embed in your site. For GTP sites we will set this up for you. To make the tutorial more real we will base this on a real company VE Graphics. VE Graphics are a large format print company specialising in exhibition displays and vehicle graphics and commercial fittouts. 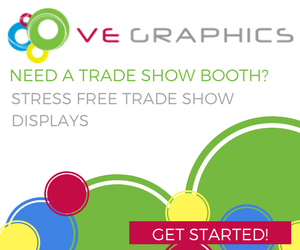 Whether you're a newcomer to the exhibition scene or a seasoned trade show marketer, VE can design an intelligent display solution to address your marketing challenges and embrace your business opportunities. VE is the WA Accredited Partner for Skyline Displays, the world's largest supplier of Exhibition Displays, Design and Services. If you need a versatile display, they'll show you how to ring the changes. If time is crucial, just watch us go into 'mission impossible' mode. When budgets are tight, we'll suggest options to help you achieve more for less. Because the decision planning and expense in purchasing an exhibition display occurs over a period of time, re-marketing is a good option to increase conversions. Note: It is recommended that you start with a small budget to test how your audiences will respond and to test out the best method for your business. Step 2. Creating your ad graphics. You willo need to create your own graphics and once you have done this it is a simple drag and drop situation. Note: there are size requirements, these are shown below. There are restrictions and limitations to what content you can have and your ads will need to be checked before your campaign can go live. Below are some examples of what you can do with the graphics and the sizes. Try keep image very visual too much text will deter users. Also the better quality and the more time you spend laying out your images the better you pay off will be you want to look professional. 1600px x 600px - side graphic: a graphic like this will show up in side bar of a users webpage. the longer length lend to more text and larger graphics. 300px x 250px - Square graphics: a graphic like this will show in the left or right hand side of websites or within articles. The smaller size means that images can often be hard to incorporate and therefore text and bright colours work better for a size like this. 350px x 50px - Mobile banner: A graphic like this one would show in the bottom of a mobile site or in a app. Given that the area is small short to the point text with limited graphics and images is recommended. 728px x 90px - Banner: A graphic like this will show at the top or bottom of a site. Images are good for this size however they are not necessary as long as you have a string call to action this ad will be effective. 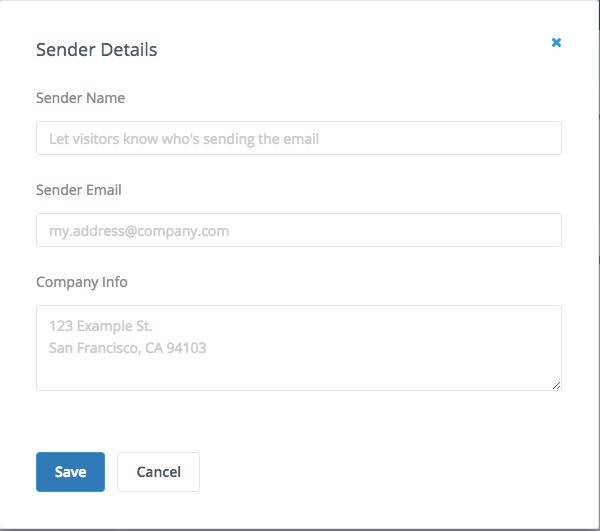 Step 3. input your payment details as prompted and then you will be able to start your campaign! it is really that simple. AdRolls offer an email ad that can be sent to everyone on your current email list, this can be a once off or an on going campaign. Step 3. Create your ad! This is the fun part below are some tips and helpful information that you can use for creating your graphics. Note: you can save your work at any time if you wish to. 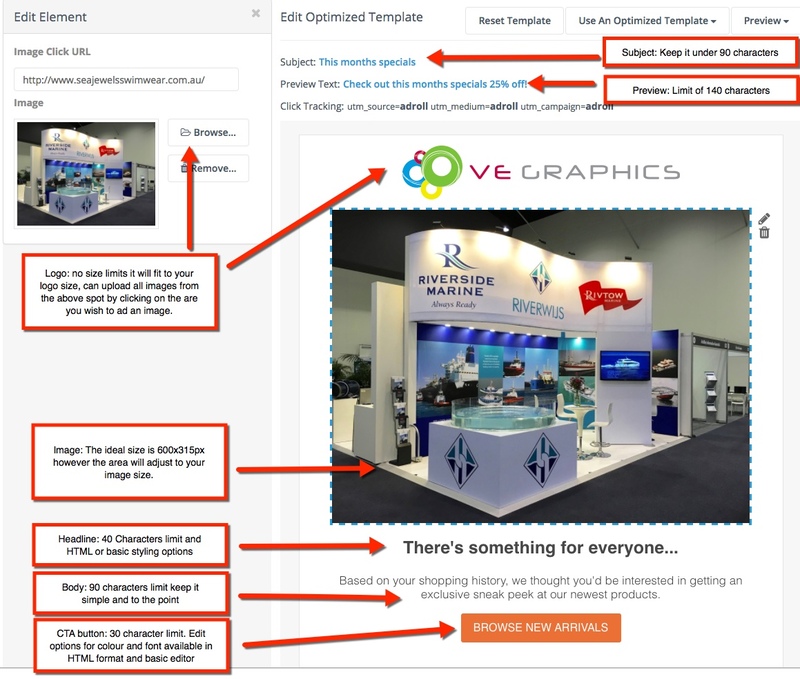 Once you are happy you can send test emails and preview what your ad will look like. If it looks how you want you can then add this to your campaign.